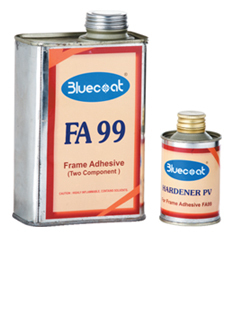 Bluecoat FA 99 is a two component Frame Adhesive for a highly chemical resistant bonding of screen meshes to frames made from aluminum, steel, wood and galvanized iron frames. After curing resistance to all screen printing inks & most cleaning agents. Stretch thefabric over frame with your tensioningdevice makingsure that fabric is in contact with the frame surface. Brush bluecoat FA-99 on the mesh containing the frame. Make sure that you have encapsulated the fabric with bluecoat FA-99 adhesive. Apply on the edge and allow it to dry for at least 10 minutes. Release the stretch tension and cut off excess fabric. The frames will be solvent resistant after 24 hours. 1 year before mixing with hardener in closed container. 7-8 hours after mixing with hardenerin closed container. The contents are inflammable so keep away from fire or any source of ignition. Please take care that the container is always closed after use in order to prevent reaction with humidity.